Then when this prophet got in the Spirit, God begin to show him what was going to take place; that there would be Someone Who would take away the sin of the world, and would rise again. He saw the resurrection of the Lord. Then, I love that, when I think. He said he stood up. He shook himself. He had been setting on a ash heap. My! What we call, today, bad luck had hit his home. His children was all killed. His riches was all gone. His health had broken down. Him setting, a Christian, or a believer, setting, forsaken. Man, even his church, had turned their back on him. Him setting there, scraping his boils. And then when the Spirit of the Lord come upon him, and he saw the resurrection this morning, you know, he stood up, and he said, “I know my Redeemer liveth, and at the last days He will stand on the earth. 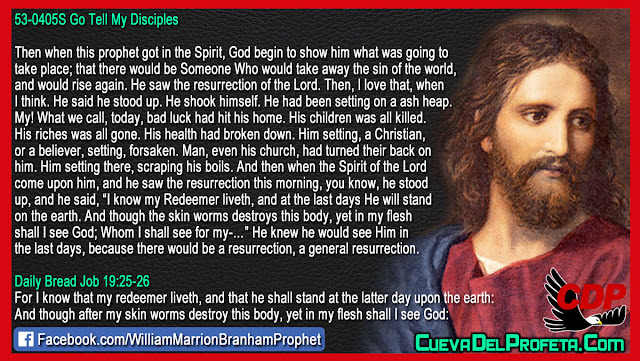 And though the skin worms destroys this body, yet in my flesh shall I see God; Whom I shall see for my-…” He knew he would see Him in the last days, because there would be a resurrection, a general resurrection.